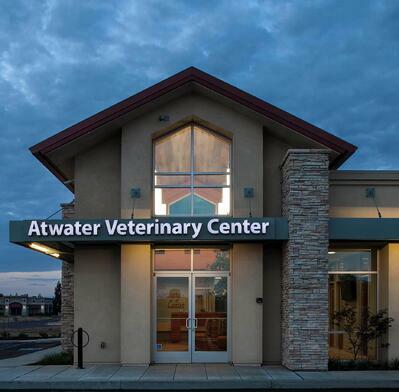 The veterinarians at Atwater Veterinary Center in California took a page from the silver linings playbook when they reframed losing their facility to eminent domain into building their dream hospital. “I guess you would call it a forced opportunity, but ultimately a great step forward for our practice,” said Dr. Carol Chiffelle, the veterinarian who headed up the build. It all started when a highway in California was scheduled to reroute through the facility they had occupied since 1973. That set off a race to make decisions, get financing and permits in place and complete construction in time to create their new ground-up build while continuing to practice medicine for their current patient population. They were able to start construction in February 2014, but the old facility was demolished in April 2014. That meant for five months the ENTIRE Atwater staff shared quarters with the nearby Merced office. Twice the staff in half the space made the team look forward to the spacious new hospital! “We wished to have a modern, state of the art, efficient hospital that would serve our needs for many years to come,” explained Dr. Chiffelle. “The design we desired was clean, professional, yet welcoming. Dr. Chiffelle said choosing the right architect and contractor was stressful but an especially important part of the process. When they interviewed architects, they instinctively knew rapport would be important. With the radical timeline, it proved to be absolutely essential to have mutual communication and trust. 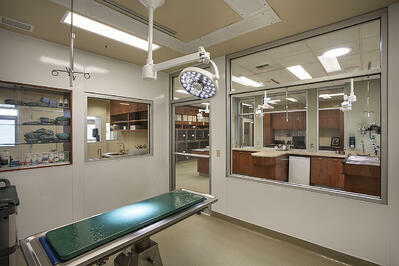 The contractor, Huff Construction, worked closely with the team to build the facility for veterinary efficiency. The goal was to blend old and new products to create a good flow. Building their dream facility sometimes required what Chiffelle called “value engineering” to stay within budget. But in the end, the center was filled with high-quality, durable material and equipment. Some old favorites that made the trip over from the old facility were the Shor-Line Classic Surgery Table and Shor-Line cage banks. 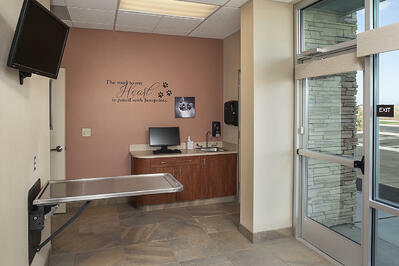 “We utilized the Shor-Line cages from the old clinic for the most part. They were in very good condition despite being 40+ years old!” she said. The cat condos and kennels were new construction to implement current thinking in dog and cat boarding. “The cat condos were a must on our wish list. Quality and durability in this area were critical. And the aesthetics are great!” she said. 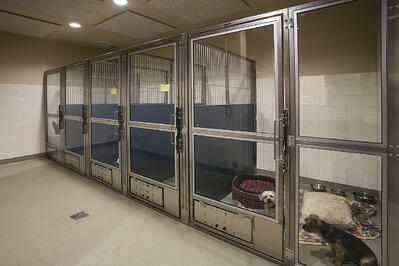 The new Shor-Line Kennel runs contain features to provide comfort for the dogs and ease of care for the staff. “Our boarders love the glass doors! We love the Lazy-Susan food and water bowl holders to limit dogs trying to escape while feeding,” she said. The team selected new wet tables, surgery lights and equipment with the goal of lasting for decades. The choices all worked together to show a beautiful facility also could be durable and easy to clean. 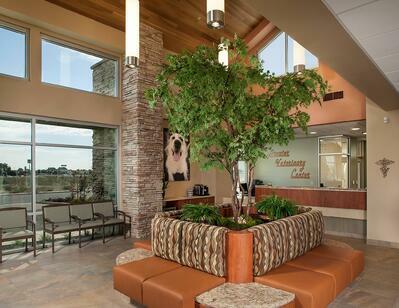 The new Atwater Veterinary Center opened its doors in September 2014. The gorgeous stone front echoes the distant strength and beauty of the nearby Sierra Nevada mountains. Identify your long-term needs and goals well before you start. Find an architect that will be responsive and you have rapport with; and listen to the architect on timelines. Establish a good relationship with your bank. It will take time to interview banks, and they will be competitive with each other. 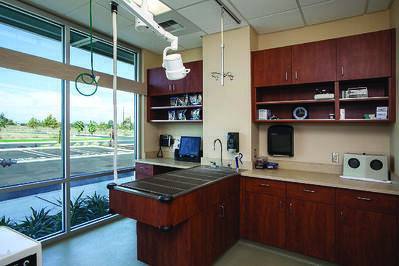 Choose a contractor who has done multiple veterinary hospitals because it is a unique construction with tricky details. Photos by Larry Falke, Larry Falke Photography.